We have three rods that are each 2 units long. The different colours are used to make the diagrams clearer and they always remain in the same place i.e the blue as the bottom layer, the green as the top layer and the red as the middle layer. The challenge is to find how many different ways you can stack these rods. 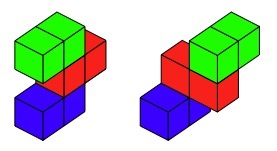 The rule is that one or both of the small cubes must sit squarely on top of other small cubes. It does not matter if they are likely to topple over. Both these two arrangements fit the rule. 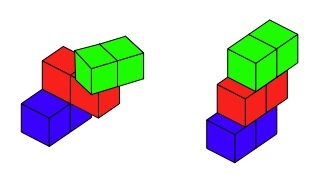 However, these two arrangements below do not fit the rule as the rods have to be lined up squarely and each little cube must sit on top of one other cube and not overlap two cubes. How can you convince someone that you have found all the possibilities? Combinations. Reflections. Practical Activity. Working systematically. Addition & subtraction. Factors and multiples. Interactivities. Multiplication & division. Visualising. Investigations.